Miami, the beautiful, luxurious city on the beach is the ideal vacation destination. This Miami blog will identify the best things to do in Miami which includes participating in the exciting beach life with beach bodies, sun, surf, and sand. You will enjoy historical places that share of days gone by such as the Gilded Age of the 1920s. Soak in the wonder of the art scene from music to visual arts, to the Art Deco architecture and pop culture. There will be opportunities to encounter exotic plant and wildlife through a tour of the Everglades National Park, and a variety of botanical gardens and conservation areas. Explore other cultures such as Latin American and Cuban cuisine, music, and art. These are all Miami day trips that are worth checking out on your vacation getaway. Considered the playground of the rich and famous, Miami is also an ideal spot for families, couples, friends, solos, snowbirds, and business travelers. A hot trend is a one day trip to Bahamas from Miami. It is crazy fun as you take a short flight and land on a remote island, void of crowds, full of sun, sand, and fun. This Miami travel blog is inviting you to think outside of the box – one of the best things to do in Miami is a Bahamas day trip from Miami! 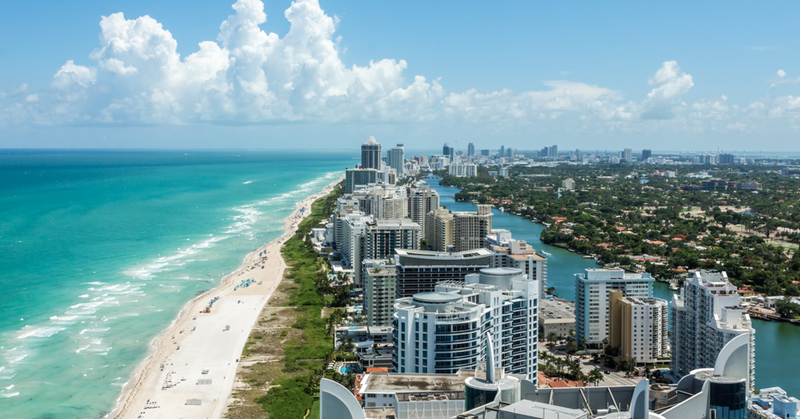 Glitz, glam, and prestige describe South Beach, a city that is always in motion; from the white sand beaches to the vibrant nightlife there are plenty of Miami attractions. The famous Art Deco architecture is a must see. Try out one of the many restaurants featuring ocean-side dining. Visit Espanola way for a taste of Spanish culture. Take in the art district with artworks from around the globe. Keep your eyes open for classic cars driving the boulevard. South Beach Miami is a trendy urban locale that is one of the best things to do in Miami. One of many Miami day trips is a visit to the Vizcaya Museum & Gardens, a National Historic Landmark. Sculptures, statues, fountains, pools, mazes, and hedgerows make up the gardens, all while preserving the natural habitat. Known for its Orchidarium, it is a conservation site for exotic orchids. The historic Vizcaya Village, preserved and transformed, is an educational campus for the study of architecture, history, art and native plants. Vizcaya is an ideal venue for destination weddings, receptions, and galas. This lovely, historic garden takes its place as one of the best things to do in Miami. Divided into two distinct areas, the Fairchild Botanic Gardens is stunning in its diverse beauty. The Uplands feature exhibits of the forests of Madagascar, rain forests, a butterfly garden, tropical fruit pavilion, an edible garden, Victoria water lily pool, and the Baily Palm Glade. The Uplands is one of the best Florida botanical gardens in the Miami area. The Lowlands exhibits plant life of the Caribbean, coastal habitat from the Keys, and the endangered Pine Rockland habitat. There are walking tours and tram rides through the gardens. On-site are also 11 lakes, an amphitheater for large public events and The Gate House Museum. Coral Gables was designed to draw both businessmen and tourists. A gem is the lavish Biltmore Hotel built in the Mediterranean style. It attracted wealthy and notable people from around the world. The resort has a golf course, tennis courts, a large pool, terraces, and patios. It is a venue for destination weddings and gala events. The Venetian swimming pool is spring-fed, drained and refilled every day. Other Miami attractions in Coral Gables are art galleries, museums, theaters, historic sites, gardens, shopping, fine dining and historic hotels. Coral Gables is one of the best things to do in Miami. The Miami Everglades National Park is a unique ecosystem that includes exotic plants and wildlife. The Everglades encompass about 11,000 square miles with are nine distinct habitats. A visit to the Everglades is just one of the best things to do in Miami. Airboat rides offer a thrilling experience as you skim over the water at high speeds propelled by a huge fan. Your guide will take you gliding down narrow canals in search of wildlife and unique habitats. These airboat tours are one of the best ways to see the Miami Everglades up close and personal. The Ancient Spanish Monastery has a long, varied past. In recent history, the blocks of the monastery were purchased by William Randall Hearst and stored it in over 11,000 crates for decades. Finally, the monastery came to rest in Florida in 1964 and was presented to the Episcopal Church, particularly the Bishop of Florida. It serves as an active church with services on Sundays and throughout the week. Tours are available most days starting at 10:00 a.m. One of the most stunning and picturesque features of the monastery are the cloisters or arched walkways that surround the inner courtyard. The monastery is one of the Miami attractions you cannot miss. Another of the best things to do in Miami is a visit to the Wynwood Arts District. Tony Goldman envisioned the warehouse walls as canvas and hoped to develop the largest street art gallery ever seen. The Wynwood Arts District has evolved into a great complex of street art and now includes Wynwood Walls, Wynwood Doors, Outside the Walls and Wynwood Gardens. It is a community that is home to galleries and museums, restaurants and bars, and entertainment. The neighborhood also has a farmer’s market whose vendors present food demonstrations, entertainment and of course, homemade and homegrown goods. Downtown Miami is a mix of high rises and skyscrapers alongside historic buildings that speak to the heritage of Miami. Rooftop restaurants and bars offer stunning skyline views of Miami. The Freedom Tower, modeled after Giralda Tower in Spain, was a processing center for Cuban Immigrants during the Cuban Missile Crisis. The building is not open to the public; however, there are local art exhibits which are public. The architecture is a picturesque contrast to the modern skyscrapers around it. Bayfront Park is strategically placed between the museum district and downtown and is one of the best things to do in Miami. The best way to navigate downtown Miami is via the free Metromover Monorail. Car enthusiasts and James Bond fans will enjoy a visit to the Miami Auto Museum. The James Bond Exhibit & Lounge displays at least one vehicle from each of the first 23 movies and Bond memorabilia. With the Bahamas in proximity to Miami, take a Bahamas day trip from Miami to Nassau to see the 007 on-location site of Casino Royale. Or hop over to Staniel Cay to visit the Thunderball Grotto. The Spy Who Loved Me and Never Say Never Again also had film shots in the Bahamas. Also, a Classic Car Exhibit showcases American, European, and Military cars alongside motorcycles. For a splash of color, a whole lot of chrome, and some exotic designs, this is the place to see. Little Havana is a small slice of Cuba relocated to Miami. Little Havana is one of the best things to do in Miami to gain a taste of another culture. Enjoy cultural influences of the architecture, cuisine; hand-rolled cigar shops, open-air markets, pro sports (Miami Marlins) and Salsa music. The hub of social, cultural and political influences, Little Havana, has a lot of activity including festivals, parades, and other events. It is home to several famous landmarks such as the Walk of Fame and Calle Ocho. This neighborhood is home to Cuban exiles and many other Latin American immigrants. One of the best things to do in Miami is a Miami to Bahamas day trip. This Miami blog hopes to open your eyes to the remote, uncrowded pink and white sand beaches, the unique culture, and the exotic wildlife such as swimming with wild pigs, feeding green turtles, flamingos, iguanas, stingrays, and sharks. There is island hopping from cay to cay to enjoy everything. From the indigenous Lucayan Indians to the great explorers such a Columbus, to Blackbeard and his pirate pals, to British Loyalists who fled America bringing with them their African slaves and plantation lifestyles, The Bahamas is a mixture of these cultures. You will see it in the colonial architecture painted in bright Bahamian colors; the celebrations of Junkanoo, dancing, parades, and Rake N’ Scrape music; and their cuisine of seafood and tropical fruits. Water sports abound such as diving, snorkeling, and kayaking. The Bahamas is the boating capital of the world; there are many luxury yachts and sailboats cruising the waters. There are big game fishing and bonefishing. There is championship golf as well. You can experience it all on a one day trip to Bahamas from Miami. The proximity of the Bahamas to the States allows easy access by plane. Bahamas Air Tours can easily get you to the Bahamas for Miami to Bahamas day trip. We can get you to the remote Out Islands that many people miss on their trips. English-speaking and trading with the US dollar make it easy to navigate. From outdoor activities and pristine beaches to an enticing active nightlife, there are Miami attractions from which to choose. History, art, culture are all vying for a spot on your list. One of the best things to do in Miami is a Bahamas day trip less than an hour away. Hopefully, this Miami travel blog has turned your mind toward the Bahamas. There you will find everything you can find in Miami and more, all with a Bahamian twist. Hear the siren call bidding you to come to the islands, enjoy the deserted, pristine beaches, taste and experience a new culture. The Bahamas Out Islands are an affordable luxury and are the best thing to do in Miami. Jump out of the box and try it.